I like to think of Cappadocia as my second home. Even though I get a buzz from going to new places, I adore the familiarity of the region and I’m not the only one because there are many good reasons to visit. 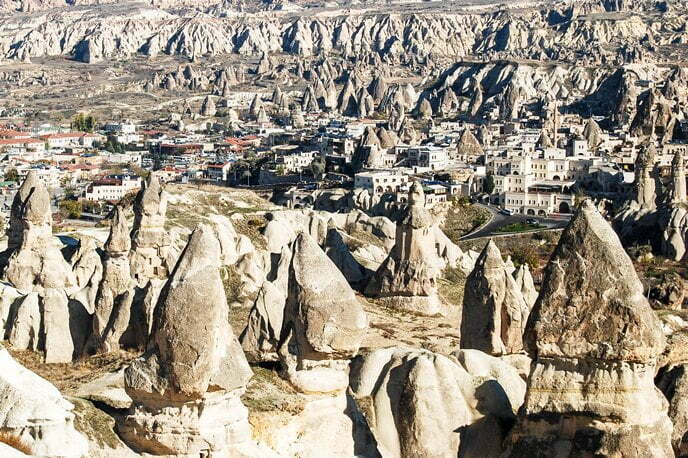 Sitting in the central Anatolian region of Turkey, Cappadocia is the country’s third most visited destination. Attracting an international audience of fans, travel magazines have labelled it as “must visit” while others called it one of the most surreal places in the world. Until the 1980s, it was a hidden secret and hardly talked about. Its main visitors were backpackers thumbing lifts and hitchhiking on the famous hippie trail that took them from Europe to Asia. Even when mainstream tourism packages took off, holiday companies avoided Cappadocia and concentrated on marketing the beach resorts of Turkey. However, the Internet changed all this since it made independent travel the new favourite niche and Cappadocia suddenly received the mass attention that it deserves. So what is all the hype about and what makes Cappadocia so unique? 1: A unique lunar, rock covered landscape, quite unlike other regions in Turkey amazes everyone seeing it for the first time. Millions of years ago, three now dormant volcanoes spewed lava across the area and over time, it harden. It was not resistant to Mother Nature, though, and wind speed conditions slowly eroded parts of the rock to create deep gorges, long, green valleys, and weird rock formations known as fairy chimneys. Places like Esentepe or Pigeon Valley Viewpoint are famous for perfect views stretching miles into the distance while trekkers love the Ihlara, Pigeon, and Red Valleys. 2: Frommers and other leading travel publications say Cappadocia is one of the best hot air ballooning destinations in the world. Ascending early in the morning, just after sunset and a Turkish style buffet breakfast, passengers have an impressive birds-eye-view of the famous lunar landscape, small towns, and valleys. If money is no object, book your own balloon, otherwise, most companies accommodate 6 to 15 people in a basket. Upon descending, champagne is on the table, and although expensive, this is the most popular activity in the Cappadocia region, and top of the list of reasons to visit Cappadocia. 3: Thousands of years ago, resourceful locals also noticed they could quickly chisel the tufa rock left behind by the volcanoes. They carved caves out of it that kept them warm in winter and cool in summer. 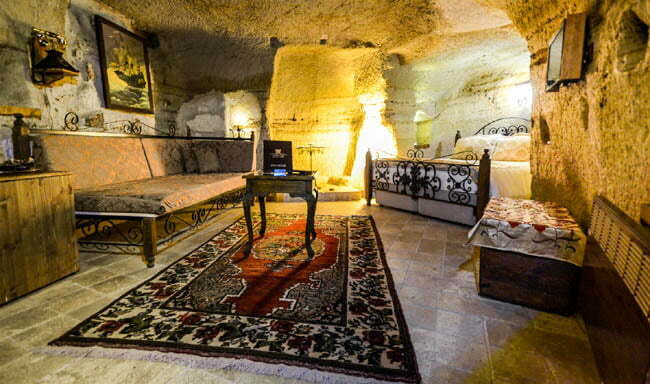 As tourism engulfed Cappadocia, the traditional cave homes turned into cave hotels. These days, technology and design trends have enabled hotel owners to offer an authentic experience of staying in a cave hotel but with all modern cons such as hot water, TV, satellite, and of course the Internet. Visitors choose from four towns for overnight accommodation. Goreme is the central tourism hub thanks to its bus station and is a favourite choice for backpackers. Uchisar is a small and upmarket luxury resort. Ortahisar still maintains its rural and traditional atmosphere while Urgup is a modern town and a favourite for big bus tour companies bringing customers to the region. 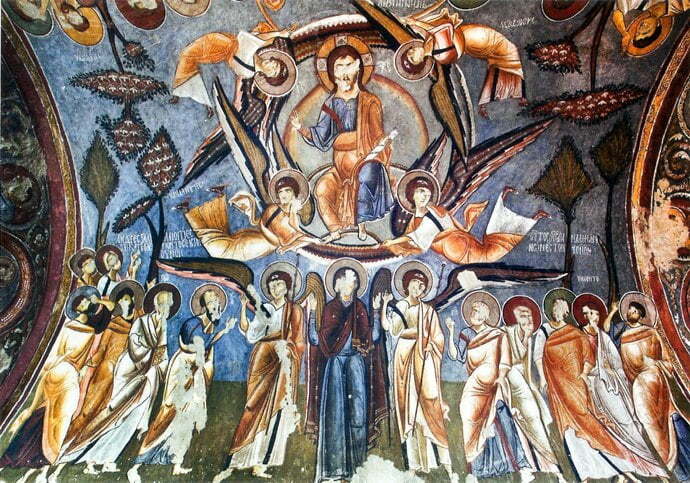 4: Historically, Cappadocia was one of the first places to embrace Christianity. As well as using the landscape rocks to build cave homes, locals created churches of which these days, the Goreme Open Air Museum is home to some of the best. Dating from mainly the 11th and 12th centuries, the exterior architecture of the cave churches gains little admiration, but the interior biblical frescoes adorning the ceilings are perfect pieces of ancient art. During Islamic Ottoman rule, locals used the churches as pigeon sheds since they had no use for them and in those days, preserving old structures was not a top priority. The frescoes faced permanent ruin, but extensive restoration has restored many of them to their former glory. 5: Possibly one of the most unusual reasons to visit Cappadocia is that it is not only a fairy-tale kingdom above the surface but also underneath as well. Hundreds of ancient underground cities have been discovered of which the biggest is Derinkuyu that housed a staggering 20,000 people. Conspiracies theorists continue to insist aliens made them, but historians and archaeologists have confirmed that man carved the mass, sprawling network of narrow tunnels and rooms. Including a chapel, school, mortuary, animal quarters and food storage, these underground cities protected families during key wartime events such as the 10th-century Arab invasions. When I visit Cappadocia, I always stay in the boutique Castle Inn located in traditional Ortahisar. Owned and managed by my friend Suat, you can read more about it here. For private, unusual experiences such as cooking classes and photography tours, I hook up with Kadir and Erkan from Turkey Tour Organizer. Meanwhile, history lovers will appreciate the intense historical knowledge of Cansu, a private guide who has taken me to many places, and provided me with insights that never appear in the guidebooks. Lovely reading your article… I am visiting Cappadocia in Jul first week, and already wrote to Kadir and Erkan from Turkey Tour Organizer. I am hoping I have an as amazing experience as you did! Hi Eric – they reckon the underground cities were used at times of invasion. Be sure to go to Cappadocia. You won’t be disappointed. Cappadocia is definitely on my Bucket List! I would love to take a hot air balloon to cruise over the amazing landscape. I didn’t know about the under ground cities! That sounds amazing to take a tour exploring all the areas, I mean 20,000 people living underground…I wonder what above ground scared them beneath the surface?? I love this post and hope to go to turkey soon, so with these things is 3 days enough to explore everything? Miss this place. i want to come back. We have visited Turkey and Cappadocia twice through the Turkish Irish Educational and Cultural society. It is a most beautiful country with a spectacular history embracing Europe and Asia. I was unaware of the Fairy Chimneys until a friend of mine went there for a photo shoot. I have never see anything quite like them and have been to many areas with volcanos but I guess not the winds. I am looking at the Castle Inn now and thinking of a return trip to Turkey. I’m incredibly intrigued by the landscape and that cave hotel. How freaking cool is that?! I have only been to Turkey but loved everything about it. I see pins and such about Cappadocia and it looks marvelous. We love Turkey and we really want to come back. This article makes us want to return all the more!